Do halving life effects have multiplier qualities? & what Vraska to use? Where's my boy Razaketh, the Foulblooded !? Also Balefire Dragon , Archfiend of Despair , Sower of Discord , Archfiend of Depravity , Demonlord Belzenlok , and Iroas, God of Victory ? You also need some EDH staples such as Return to Dust , Anguished Unmaking , Vampiric Tutor , Demonic Tutor , Teferi's Protection , Sensei's Divining Top , and Boros Charm type stuff! A good Sword of Feast and Famine , Sword of Fire and Ice , Whispersilk Cloak , and Darksteel Plate to keep Kaalia alive and unblockable are highly suggested! Also a good Lillianas Contract is a pretty decent way to win, a bit janky but I like it. I think a some graveyard recursion would be great too like Reanimate , or depending on how the deck develops Primevals' Glorious Rebirth ! Lastly just remember that EDHREC and Scryfall are your best friends when building edh decks! Also don't be afraid to look at other Kaalia decks for cool cards/combos ya know? SpeedOfLightning on The Greatest Show(De)man! MTGSmith the play testing I've done has turned out really well! I've tried other decks but yours seems to be the most efficient! Plus, I love the flavor from some of these cards, like Cruel Entertainment . This is definitely a deck that I may not win with but I'll definitely have fun with! I don't know if you caught this, but I found a combo with Archfiend of Despair and Havoc Festival . If you can get both out safely, then you just let everyone lose during each of their turns! Let me know how your play testing goes and if you make any changes! Wound Reflection : A different way to get "doublestrike." Also incentivises people to attack other players for the same added value. Archfiend of Despair A different way to get "doublestrike." Also incentivises people to attack other players for the same added value. I'd cut Sun Titan for sure. Can only get 8 targets, not counting signets, and of those, only a few have actual real value in being reccured. ElderCheese on He's A Riot! Thanks for the comment. I'll take a look at your deck and share some feedback on your page. Archangel of Tithes is ok, 3/5 flying for CMC4 isn't terrible. The stax isn't board changing. Assists with go-wide strategies, unless their tokens also tap for mana, but usually those are Impact Tremors type hits anyways. I don't think he strong enough with all the impressive A/D/D available. 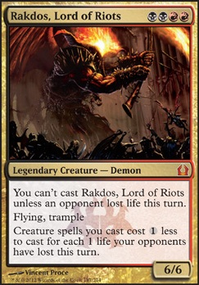 I'd rather have the Rakdos the Defiler in many situations, he seems weak (I know, I struggled with him for VERY long), but he can slow down Grixis/Izzet decks just long enough that I can combo before they do. Or if I'm mana screwed or something, or Kaalia of the Vast being controlled, he can keep the board even. Creates an ok lock with Volrath's Stronghold sometimes too. 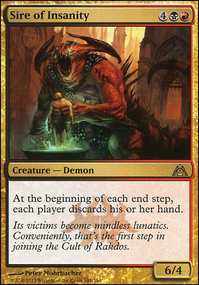 Master of Cruelties can do the job against Grixis/Izzet usually too, but if they have a Baleful Strix or Bitterblossom or something you're going to lose to a Show and Tell + Omniscience combo without a tutored Rakdos the Defiler. Lord of the Void is amazing, I just took him out last week to test Mausoleum Secrets supported with a Street Wraith (why play 99 card commander when you can play 98 card commander with 38 life :). He was great when versus Eldrazi decks, or even Mono Green/Big Green Commanders. The reason he eventually got cut is because of his lack of Trample. Flample would be an auto-include, found he wasn't connecting enough and inconsistently. Archfiend of Despair also is great, I've been putting him in an out testing various new cards. Thought he would act like a Gisela, Blade of Goldnight but didn't work that way. Rarely does Life matter that much in Commander (Combo commander), but sometimes it does, Selesnya for example, Often he slows down combat between opponents, unless they get the strategic advantage. I try and combo instead of damage, if my primary strategy was damage, he would be an auto-include. Very good. His CMC8 was the ultimate reason I didn't go with him, would never tutor him (better options available) and didn't support my primary win-con (but very helpful for secondary). Entomb I'm just not sure what to pull with it? It does support Mausoleum Secrets and can be cool early Iona, Shield of Emeria with a Reanimate for example. If you're playing Entomb (and a reanimation sub-theme) definitely play Gamble as well. I just feel I don't have enough early recursion to really take advantage of an Entomb. Chances are if you do the hyper-geometric probability is low for it's utility, someone like Kess, Dissident Mage LOVES this card. Thank you so much for putting together this list. It's been a huge help in putting me on the right track towards my own build, Which I had to make a few budget options and choices based on my play group. Here's my "Budget Version", I haven't gotten around to the description yet but I will be sure to include a link here if that's alright. 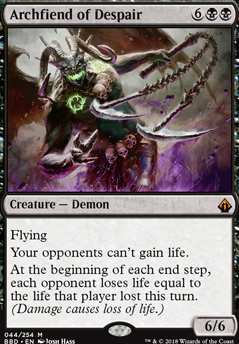 Archfiend of Despair doubles the hurt while counting as life lost vs. damage taken and prevents opponents from gaining life. Vandalblast so opponents don't have their own mana rocks after laying down Armageddon? My local game stores big matchup this past Monday was my Kaalia vs Yidris, Maelstrom Wielder Storm. Game 1: Gisela, the Broken Blade with Lightning Greaves on the assault. Blew up his lands with Ravages of War early game to prevent his progression. Game 2: He came heavy with control using Noxious Revival to return Force of Will for additional counter. I ensured each bait card would devastate his field to remove the counter spells and tie up his mana to slow me down. Drop Kaalia, Avacyn, Angel of Hope, and Archfiend of Despair for the win. Game 3: Turn 1 he dropped Sylvan Library and preceded to make gains with card advantage. I got greedy and blew the field with Armageddon and Enlightened Tutor for Crucible of Worlds. This failed to slow him down and he got the win. Game 4: The final game was a challenge. Dropping Sol Ring and Dark Tutelage for advantage didn’t work as he was working hard now for control. My only option left was to take out Yidris with Swords to Plowshares and Path to Exile. I managed to tutor Moat and get it into play just in time to stop Yidris hitting the field for the last time. He cast Cyclonic Rift overload, swung, and whiffed the cascade. I managed to secure Moat once again and proceeded to advance my field. Sol Ring and Mana Crypt were my key players here helping me rebounded from the CycRift and take the game the next turn with lethal damage.